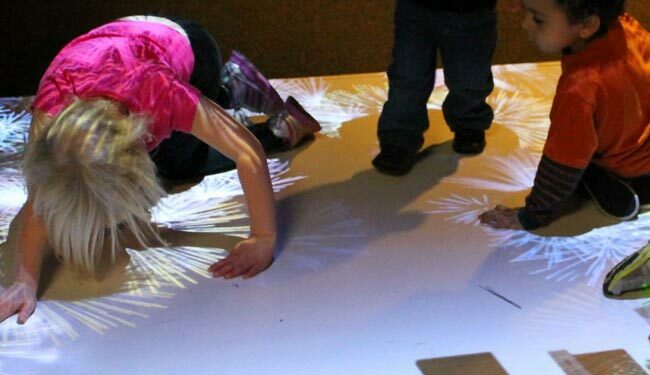 A BEAM interactive games installation was revealed on New Year’s Day at the Children’s Museum of La Crosse. Located in downtown La Crosse, Wisconsin, the motto of Children’s Museum of La Crosse is “learning and fun rolled into one.” It is the first hands-on learning environment for children in the region and features three floors of hands-on exhibits. More information about the Children’s Museum of La Crosse can be found at http://www.funmuseum.org. One of Children’s Museum of La Crosse‘s missions is to assist the young ones to grow and learn through interactive playgrounds. Exhibits include everything from a climbing wall and operable kid’s crane to a giant pin screen and kid sized convenience store. The BEAM is currently located on the first floor of the museum. Historically, Children’s Museum of La Crosse has shied away from technology exhibits because they tend to be breakable and are often not hands-on in nature. However, due to its virtual element, it is not possible for children to break the system. Further, it doesn’t require ongoing maintenance or supervision by a museum employee. These were all elements that made the system attractive to Snow and her staff. Shortly after the exhibit’s opening, Anne Snow watched a girl with a wheelchair playing the BEAM fireworks game. The girl was shy at the beginning but after a few minutes she rolled out onto the floor and began to interact with the BEAM System.